Teotihuacan, meaning “city of the gods”, is the Aztec name for a mysterious ancient city and home of the world’s third-largest pyramid. We don’t know who built it, who lived there, what language they spoke or even what they called themselves, but they left behind an incredible architectural legacy for us to discover. Teotihuacan, pronounced “tayo-tee-wah-KAHN”, is one of the largest and most important archaeological sites in Mexico. Walk the Avenue of the Dead and scale the stone peaks of this ancient urban landscape with these top tips for visiting Teotihuacan. Sundays are free for Mexican residents, so the site gets particularly busy. Midweek is a less busy time to visit and Mondays slot perfectly into a compact itinerary because most of the country’s museums are closed on that day. Plan to arrive at Teotihuacan first thing in the morning. The archaeological site officially opens at 9am giving you a full hour head start of the tour buses that generally arrive at 10am. Not only will you avoid the crowds but it will be cooler as there is very little shade in the complex. We looked at the various options including public bus (the cheapest) and taking a small group tour. However, because it is ideal to get there before the larger tour groups and we wanted to be as efficient as possible with our 3-days in Mexico City, we opted to Uber. Generally, an Uber from the Mexico City historic district will cost between MXN400-1000 (USD20-49) each way, plus tolls for the 40km (25mi) trip. Enter “Zona Arqueológica de Teotihuacan Estacionamiento Puerta 1” into Uber to be taken to Gate 1. Although my advice is to actually go to Gate 2 first (more on that later), there is no official address in Uber, so you will have to ask the driver to take you to “Puerta 2” once you arrive on site. DO NOT just put “Teotihuacan” into Uber or you will end up in the nearby town of the same name. 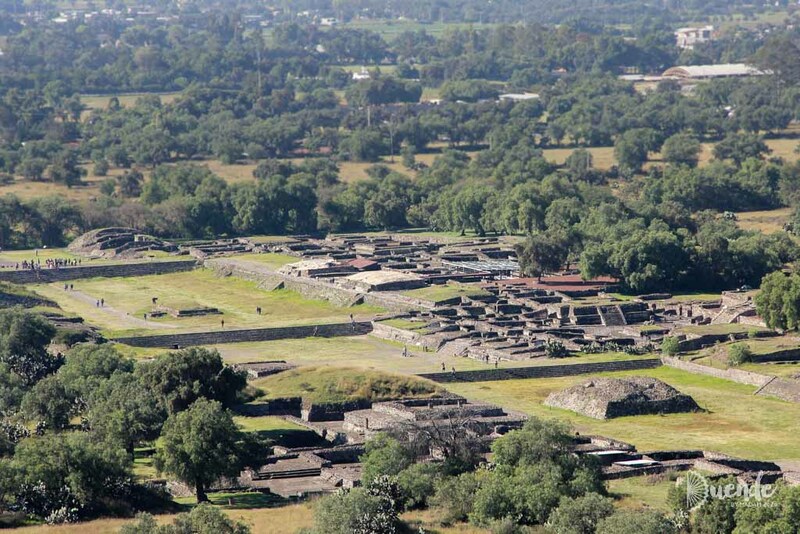 The toll road is the quickest way to get to and from the Teotihuacan archaeological site from Mexico City. Confirm with your driver that they will take that route, in Spanish “la carretera de cuota”. Most drivers will ask you to cover the tolls separately, so ensure you have MXN77 each direction in cash (roughly USD4). I’m going to reiterate – be there at 9am when it opens! General admission is MXN70 (about USD3.50). Begin at Gate 2, because it’s directly opposite the Pyramid of the Sun which you will want to attack the minute you arrive. By doing this you will have to backtrack a little later, but most importantly you will avoid the enormous queue that gathers in the ruthless sun to climb the Pyramid later in the day. It will also mean your photos from the top will be relatively people free. Once you are done with the Pyramid of the Sun, continue to the Pyramid of the Moon for the same reasons, then return to Gate 2 or 3 to hire yourself a guide for the remainder of your exploration. Leave the Museum until it has really heated up outside, you have finished your guided tour and you’re ready for break. Near the Museum is a botanic garden, restrooms and shaded picnic tables. We arrived a little late due to an ATM issue, went through Gate 1 and had to walk most of the 2.4km Avenue of the Dead to get to the Pyramid of the Sun, losing us precious time. Once we were done pyramid climbing, we tried to find the gate reported to be at the rear of the Pyramid of the Moon which evidently had long been shut and overgrown. By the time we circled back to Gate 3, we couldn’t find an available guide – facepalm! If this happens to you or you prefer not to hire a guide, you will find signage in English throughout most of the site except, strangely, the Museum. Wear comfortable, non-slip walking shoes. The site is enormous and you will be covering a lot of ground throughout your visit, including scaling the uneven stone stairs of the Pyramids. There is almost no shade on site and the barren ground heats up quickly. Take sun protection – hat, sunglasses and sunscreen. Wear light, breathable fabrics with sleeves to keep you cool and shielded from the sub-tropical sun. It can be cool on winter mornings when you will likely need a light outer layer. Take plenty of water and snacks to get you through 3-5hours. A backpack is ideal for keeping your hands free when scrambling up and down the steep sides of the pyramids. Don’t forget a camera with a fully charged battery and plenty of space on your SD card. Sunscreen, hat and sunglasses again are a MUST. Find flights to Mexico City with Skyscanner. Search for accommodation using Tripadvisor or Airbnb. Enjoy visiting Teotihuacan with its formidable pyramids, ancient murals, serpent sculptures and enigmatic history. For more on exploring in and around Mexico City see this 3-day itinerary.